Decred is a decentralized blockchain platform which was launched on February 8, 2016. It aims to be an open, progressive self-funding platform based on its community. Like many other decentralized cryptocurrencies, Decred uses cryptography to secure transactions on its network and also to control the creation of new coin into the system. It has a public ledger in which all transactions are recorded. Decreds’ developers claim the technology is simple to use, allowing users receive, send, and mine the digital currency in few clicks. Decred also provides some command line tools to enable you to customize the user experience. The digital currency tries to prove the true meaning of decentralization with its cryptocurrency, not being controlled by any force. Decred is a vision of a few core bitcoin developers who dreamed of a purely decentralized currency which has no room for it being hijacked and dominated by a group of people. Everyone’s idea is welcomed. Both miners and users have the same right to contributing to the community and helping it grow. With a collective effort, they have seen the community grow from the ground to where it is today, and they owe the achievements to every community member’s participation. A whole lot is going on for Decred, but it’s important to know what it is and the technology behind the platform before we can fully understand its operations. Decred is a community based open-source cryptocurrency. It’s designed with a built-in governance system to resolve centralization conflicts going on in the Bitcoin system and also to address the everyday tragedies within decentralized cryptocurrencies. The system utilizes both the Proof-of-Work (PoW) and Proof-of-Stake consensus protocol. With its unique hybrid system, combining PoW and PoS, Decred can create a sound currency. This allows anyone in the world to participate in the project regardless of whether they own expensive mining hardware or not. Algorithms aim to let users agree on the state of the blockchain. There are two strategies for reaching consensus on a decentralized network. Proof-of-Work (PoW): It’s merely getting rewarded for work you invest into the system. This step requires computational power in solving cryptographic puzzles. For every solution, a new block is created. So the more work you put in, the higher the reward that comes to you. Proof-of-Stake (PoS): This is getting rewarded for what you stake. This requires you to keep your coins untouched for some time to prove you are a stakeholder. The more coins you stake, the more your reward. The hybrid PoW/PoS system implemented by Decred allow Miners create new blocks and stakeholders vote to verify blocks created by miners. The process of creating consensus is therefore balanced with miners and stakeholders contributions to the ecosystem. With this, the hybrid consensus system is stable and safe, bringing the chance of any one party dominating the Decred’s blockchain to zero. Also, Decred provides unchangeable transaction hashes, separating transaction signatures from the rest of the transaction data. This is similar to what SegWit achieves in Bitcoin. Decred also utilizes Schnorr signatures, also having the ability to sign transactions off-chain. These features are what makes Decred a step ahead of Bitcoin. What’s unique about transactions on the Decred platform is the ability of transactions to expire after a certain period. All transactions come with their expiration fields, which when filled in, prevents the transaction being added to the blockchain after certain block height is reached. With this, transactions are automatically canceled in cases of confirmation delays. DCR is the official coin for the Decred’s network. Though not a fork of bitcoin, it aims to be a better cryptocurrency than bitcoin for day-to-day transactions; a faster, and most especially not controlled by a set of people. Decred (DCR) has a max supply of 21,000,000 (21 million) coins. Providing bookkeeping services to the network. Ensuring the safety and stability of the network. Introducing new coins into the system. Mining is technically “minting” your currencies. The process of mining requires two things: a software program, that either solo mines or connects you to a pool where you join resources with other miners. You also need an upgraded hardware device to mine, the higher it’s configuration, the more you make from mining. 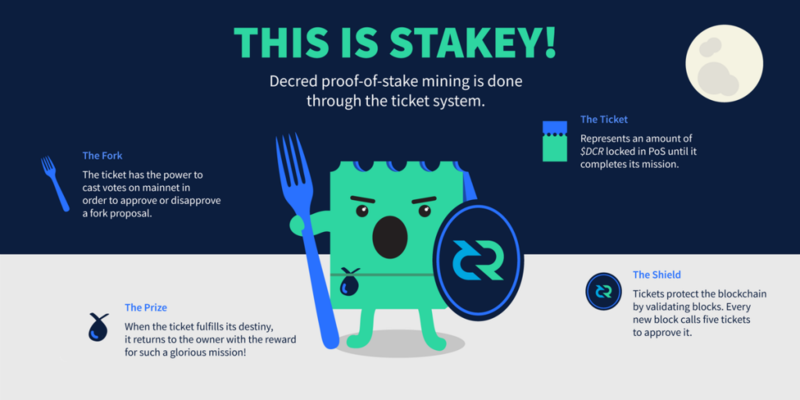 The Decred’s team have their official miner called the GoMiner. You can download the GoMiner for your OS here. Decred also lists two unofficial miners on their website, the CCMiner, and SGMiner. These two are available for the Windows OS and can be downloaded here. Note: Each software has a hardware requirement, so it’s important you read through the instructions before you run any miner on your PC to avoid damage and loss of valuable information. Like every other cryptocurrency, Decred is stored in a wallet. These wallets are likened to real life wallets. There aren’t many options available but the official wallet for Decred has got the team regularly working on it, and it’s available for all major operating systems. You can download the Decrediton wallet for Windows, MacOS, and a Linux unit. There’s also an option of a web wallet. The easy to setup wallet can be accessed here. Exodus is a user-friendly, multi-cryptocurrency, secure, third-party desktop wallet you can use to secure, manage and exchange you Decred coins. You can download Exodus for your operating system here. You don’t only own a cryptocurrency by mining them; you can also purchase them from cryptocurrency they are listed. Bitcoin and Doge can be exchanged for Decred; it can also be purchased using fiat. Decred is listed on Bittrex, Poloniex, FEX, Upbit, Cryptopia, Zhaobi, BleuTrade, Tux Exchange, and Bisq. You can also have any other cryptocurrency you have instantly exchanged for Decred at these platforms: ShapeShift, Flyp, Godex, CoinSwitch, Evercoin, and Changenow. You can also purchase Decred with fiat at LiteBit (EUR) and Coinspot (AUD). The price of Decred has been flat since inception until March 2017 when it made a high of $16. It has since been on steady growth. Decred has it’s low at $0.42 and a high at $121.70. At the time of writing, Decred is sitting at $63.11. The community has got a lot of plans for the future. These include implementing a stakeholder-directed DAO (decentralized autonomous organization), decentralized control of development funds, lightning network implementation, an enhancement to privacy on the network, and more. The PoS voting system will have a positive impact on the development of decisions are taken in a decentralized nature. Users will, therefore, vote for improvements that’ll affect the value of DCR coins positively.